While working out seems pretty self explanatory and simple enough to do without too much thought, it is easy to make mistakes and get injured. Workout injuries can happen suddenly to anyone. It doesn’t matter what your fitness level is, even if you are a personal trainer, you can get injured during your workout. Getting injured during a workout not only affects your everyday life, but it also can throw off your entire fitness goal, setting you back, and making it harder to restart once your injury is healed. 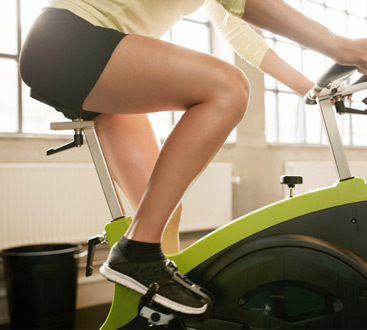 Workout related injuries can vary in severity and can affect many different areas of your body. Injuries can set you back and make the last few months of hard workouts worthless. If you are working towards a fitness goal, don’t be set back by an unfortunate injury. 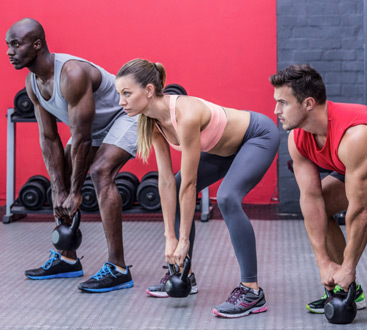 At BodyPlex Fitness, we give our team the knowledge needed to avoid injury and help our members know the right methods and techniques to different workouts. These techniques will help avoid injuries, keeping you on track to your fitness goals. In this blog, we are going to go over some of the most common injuries and how to avoid these injuries. Stay healthy and feel great as you work towards your goals are don’t be set back by annoying injuries! According to Outside, a study published in the Journal of Sports Science and Medicine found that ankle sprains account for 15 to 30 percent of all sport injuries. An ankle sprain occurs when it is twisted or rolled inward or outward and tears the ligaments connecting the bones and forming the joint. Like many injuries, an ankle sprain can put you at risk of getting this injury again. This sprain can be caused in many different ways, especially running on uneven surfaces, workouts that involve jumping, or changing directions quickly. But you can sprain your ankle while simply running on the treadmill. If you are running and lose focus, you may drift off the side of the treadmill, stepping half on the belt and half off, throwing off your balance and causing you to jump off quickly. This could lead to you landing awkwardly and injuring your ankle. To best avoid this injury while running, there are a few things you can do. While running inside, be sure to stay focused on your workout and not drift to one side or the other. If you choose to run outside, make sure your path is flat and even. Running over curbs, potholes, or other uneven ground put you at a higher risk or injuring your ankle. The Outside article also notes that training reflexes resulted in a decrease in injury rate. Working on balance by standing on one foot or using a balance board can help improve your reflexes and coordination, decreasing injuries. If you are prone to ankle sprains, wearing braces or taping your ankles will help you to avoid a future injury. Back pain is never fun and it is a common fitness injury, whether it is because people do not know how to lift correctly or try lifting too much. Lower back pain often starts with a desk job. According to an article from Men’s Fitness, a person who is sitting at their desk all day with a slouching and rounded upper back is more likely to get a lower back injury when they head to the gym. If you leave work and head to the gym to try lifting weights, especially something like an overhead shoulder lift, your upper back may not extend properly. This will cause your lower back to overwork, causing anything from soreness to a more serious injury. An article from Top Fitness Magazine, mentions that lower back pain can be caused by muscle strain, nerve compression, or a herniated disk. But knowing the proper form for different exercises will help to keep your back from facing injury. The Men’s Fitness article also describes different ways to prevent lower back pain. Stretching and strengthening your upper back can help to compensate for the poor posture you used during work. A stronger upper back will take pressure off of your lower back during a workout. Strengthening your back and learning how to properly do different lifts can help you avoid lower back injury. There are many different knee injuries that are fitness related. From ACL tears to IT Band Syndrome, you can suffer from a wide variety of knee pains and injuries. Runner’s knee is one of the most common of the knee injuries. Also known as patellofemoral pain, it causes pain under and around the kneecap as well as swelling. This is the most common injury in runners, so if you are a fan of running as your workout, be sure you know how to prevent or at least reduce your chances of getting runner’s knee. According to a Livestrong article, runner’s knee occurs when the bones in the lower leg are not lined up perfectly. This causes an abnormal gliding between the kneecap and the thigh bone. The Outside article notes that weak quads may be a factor in runner’s knee. Tone and strengthen your quads to help avoid runner’s knee. The Livestrong article also states that strengthening hip flexors can help keep the knees healthy and prevent this injury. The radiating pain that is known as a shin splint is a tricky injury. The Outside article mentions that the cause of shin splints is not entirely known. Even though they are common, the origin is not known. Some researchers believe that shin splints are caused when the lining on the shin bone gets inflamed. Others believe that they are from tiny fractures in the tibia. Either way, there are a few methods to try to avoid getting shin splints. One way to avoid shin splints is to gradually increase the intensity of your workout. Many people who increase the intensity too quickly may face more shin splints. Wearing proper shoes, and strengthening and stretching the calf muscles may also help you to avoid shin splints. Sport and fitness related injuries are not only painful, but they can make it difficult to stay on track with your goals and keep up with your fitness level. If you have worked hard to get to the point you are at now, an injury is the last thing you want. As we mentioned before, anyone can get injured during a workout. Even personal trainers. But to avoid injuries as effectively as possible, be sure you strengthen different muscle groups, stretch areas that get tight during your workouts, know the proper forms for different workouts, and never lift too heavy. At BodyPlex Fitness, we want our member to stay safe and continue working toward their goals. Our team is dedicated to helping our members learn the proper techniques and forms for different workouts and machines. Take your workouts slow, don’t forget to warm up, and make sure you are stay safe while working out. You never know when you might fall off of the treadmill and sprain your ankle. Be sure to keep these safety tips in mind next time you head to the gym, they will help you to avoid injury and stay working your way toward your goal! Learn more about BodyPlex Fitness and contact us today!